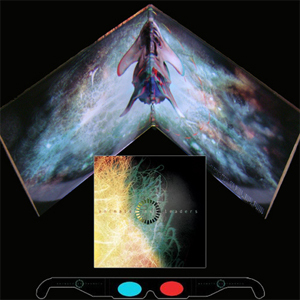 On July 10, Prosthetic Records will release an expanded "encore edition" of the groundbreaking self-titled debut album by instrumental progressive metal pioneers ANIMALS AS LEADERS. It will include three bonus tracks -- the live setlist standard "Wave Of Babies" (previously unavailable on CD), a 2001 demo called "Orea" and the never-before-heard "Kalimba", a short teaser for which can be seen below. In addition, physical editions of the album will include enhanced artwork featuring 3-D imagery and custom AAL 3-D glasses. Pre-orders (including a low-priced CD/t-shirt bundle) are now available right HERE. ANIMALS AS LEADERS' impact on modern heavy music cannot be overstated. When Tosin Abasi released his debut solo album under that moniker in 2009, few could have foreseen the band's meteoric rise. Although Abasi had earned acclaim as the lead guitarist in the Washington, D.C.-based metalcore act REFLUX, it was unthinkable that an instrumental album of progressive metal with jazz, electronic and ambient flourishes would develop anything more than a cult following. The album quickly caught fire, though. Steve Vai hailed the band as "the future of creative, heavy virtuoso guitar playing"; Guitar World featured Abasi on its cover; the music video for "CAFO" began accumulating the first of its more than 6 million streams to date; the group was invited to tour alongside the likes of DEFTONES and MESHUGGAH; and soon enough, ANIMALS AS LEADERS' self-titled debut -- produced, mixed and engineered by Misha Mansoor (PERIPHERY) -- became not only genre-defying, but also genre-defining, spawning a thriving instru-metal subgenre that continues to push musical boundaries today. "The Price Of Everything And The Value Of Nothing"